Whiteaker wrestler Jeremiah Ratliff won his match at 160 pounds to seal the win over rival Claggett Creek at McNary High School on Thursday, Feb. 22. When 160-pounder Jeremiah Ratliff earned a pin on Thursday, Feb. 22 at McNary, he didn’t just get his first win of the season. Ratliff also sealed the victory for his team as Whiteaker Middle School topped Clagget Creek 58-36. 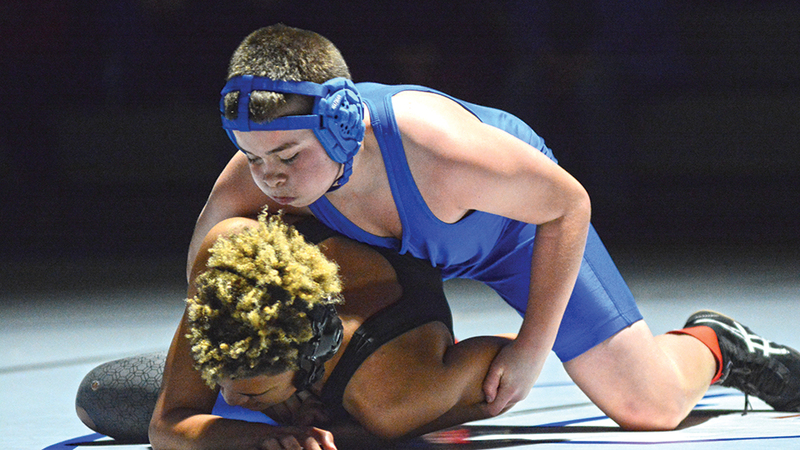 Whiteaker led from the beginning as CCMS had to forfeit the first two weight classes, 75 and 80 pounds, as brothers Brandon and Max Blanco, both undefeated, were absent. Jesse Dyer (85), who finished the season undefeated at 10-0, then won his match 7-0 to give the Wolverines an early 15-0 lead. Jordan Orr (90) got the Panthers on the scoreboard with a pin. CCMS then won by forfeit. But Whiteaker won the next six matches to take control. Hunter Ruberto (102), Jacob Moore (110) and Luke Moreland (117) all won by fall. Ben Standley, who finished the season 8-0, added a 16-4 major decision at 125 pounds. Aiden McCoy (132) then won by decision and Destiny Rodriguez (140), who finished the season 9-0, got a quick pin. Claggett finished the dual strong, winning four of the final six matches as Aron Montoya (150), Jakob Munson (175), Luis Cortez (195) and Layne Runyan (220) all won by fall. Aldo Villalvazo (275) finished the dual with another pin for the Wolverines. Whiteaker, which had 57 wrestlers, including 10 girls, both school records, finished the season 8-2. Claggett had 42 kids participate in wretling this season and finished 6-3-1.